Do you want to experience something different with your running habits? 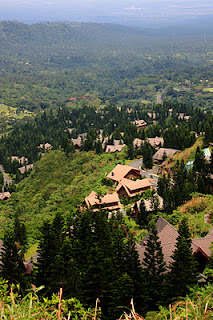 A breathtaking view of nature overlooking the lush greeneries of Tagaytay, an uphill road course through rolling hills, and never-before-opened running areas are what makes the Nathan Ridge Run different from other common fun runs. 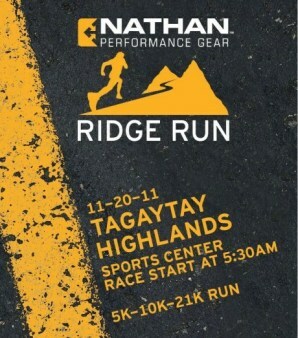 It will be held on November 20, 2011 at Tagaytay Highlands. The race is organized by renowned multi-sport accessory brand Nathan Performance Gear (Nathan), who will challenge Filipino runners in a unique test of athleticism, endurance and environmental advocacy. Nathan will provide participants access to previously off-limits tracks, resulting in a fresh, challenging and steep uphill road course meant to push the limits of each runner. While in the venue, runners can also take advantage of several exclusive perks, including access to some of Highlands’ amenities and discounts. The Nathan Ridge Run features three race divisions for the beginner to the elite with its 5K, 10K and 21K road distances. Runners are set to get their hearts racing for health and for nature. Beginners can hone their craft and endurance, while veteran athletes can improve their level of game. Nathan will implement environmental solution to the common sight of a running event - the thousands of plastic cups scattered on the roads after drinking water. Instead of having plastic cups, each race kit comes with a free Nathan handheld sports bottles as the racers’ own hydration gear. Runners can also use innovative bottles such as the Nathan Quickdraw Plus, which provides them easy access to hydration while on-the-go. To answer the need for sufficient hydration, Nathan will be setting up conveniently placed refilling stations at different points of the road so we can just refill our own sports bottles/ tumblers. We are not only helping our environment, but we can also have something to drink at anytime we get thirsty. Can you find me here in this photo? 1. Is it road or trail? It is a ROAD course with numerous uphills and downhills. Scenic views include Mt. Makiling and Taal Lake. 2. Will shuttles be provided? There will be NO FREE shuttle from Manila, but DIRECT BUSES will be available for booking on a first-come-first-serve basis. Organizers hired these vehiclesfor the convenience of participants and are selling tickets at cost. Buses will start to load at 2:30AM. 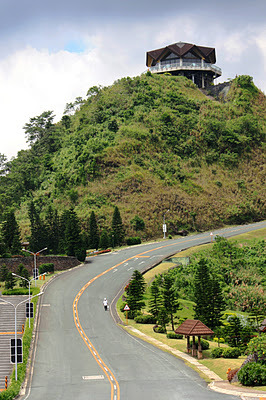 ETD (Tagaytay Highlands) – 10:45AM, ETA (R.O.X.) – 12:30PM. Reservations are done together with registrations. 3. Can we bring guests? YES, non-participants are allowed within the venue provided they are WITH A PARTICIPANT. Family/friends are allowed to get bus seats provided that booking is done by the participant DURING registration. 4. Can non-participant guests also avail food? YES, they can purchase script money (like cash vouchers) in the venue and use it to buy food. 5. Are there accommodation options within the venue? YES, Tagaytay Highlands accommodations are available for participants at 20% off published rate. Booking must be done by PARTICIPANT ONLY. Reservations should be made AFTER REGISTRATION. 6. Can the highlands amenities be used? YES, selected amenities will be available at a discount. 7. Will there be parking? YES, and there will be no parking fees. Availability is on a first-come-first-serve basis. 8. Can I get a map of the route? We will only release the route map one week prior to the event. It will be posted online and made available on race day. 9. Is there a cut-off time? Runners who are still running beyond cut-off time may be allowed to finish the course at the discretion of the organizers. There will be cash and product prizes from Nathan and partners sponsors. Specific details regarding amount/items will not be disclosed until awarding ceremony. 11. Will there be finisher’s shirt and medals? There will be finisher’s medals for all 21K finishers and top 100 10K finishers who crossed the finish line within cut-off time. 12. Is it true that slots are limited? YES, the event is limited to about 1,000 runners. 13. When can we claim race kits? Kits will be available for claiming from NOVEMBER 1-15. Please note at least one week lead time for kits upon registration of participants. 14. Can we claim race kits in a store different from where we registered? NO, participants can only claim their kits from where they registered. Ditch Disposables. There will be no plastic/paper cups in any portion of the route. 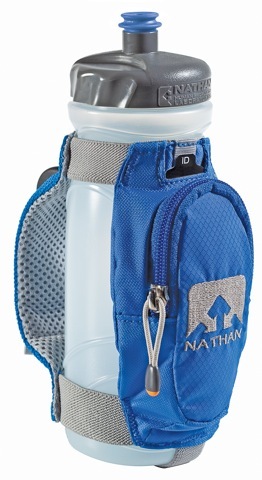 Participants must use the Nathan handheld freebie or bring any other hydration gear. Belts and packs are also allowed. 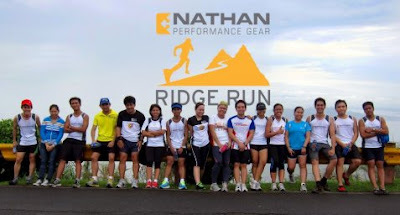 This is in line with Nathan’s efforts in promoting a more environment-friendly lifestyle in running. 15. How many hydration stations will be there? There will be SIX (6) aid stations within the route with water and/or sports drink and one at the Start/Finish line. 16. Will sports drink be provided? YES, GATORADE sports drink and PREMIER water are Nathan Ridge Run’sofficial hydration partners. For any inquiry, you may email nathan.philippines@ymail.com. For transportation and accommodation-specific inquiries, you may also call (632) 303-1234 loc.428 and look for Chito Tayag.